Microsoft's Windows 8 developer preview has been out for about a month, and the software giant is ready to discuss some new changes to Windows 8 based on user feedback. In an incredibly long and detailed blog post, Marina Dukhon, a senior program manager on the Windows 8 Core Experience team, discussed upcoming changes to Windows 8's apps screen, start screen customization, and a replacement for Windows 7 jump lists in Windows 8. 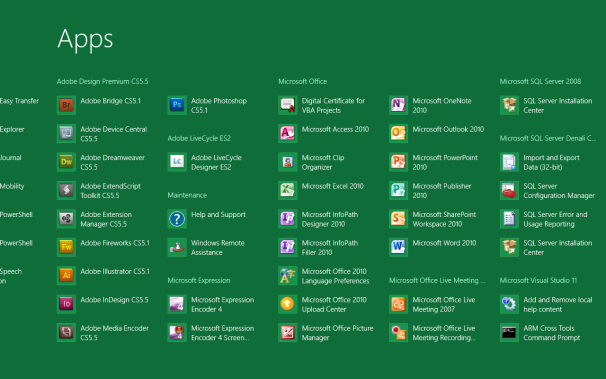 Windows 8's Redesigned Apps Screen. The biggest change announced so far is a redesigned apps screen for Windows 8. The apps screen is the replacement for the "All Programs" menu option in Vista and Windows 7 that lets you see all your programs at a glance. 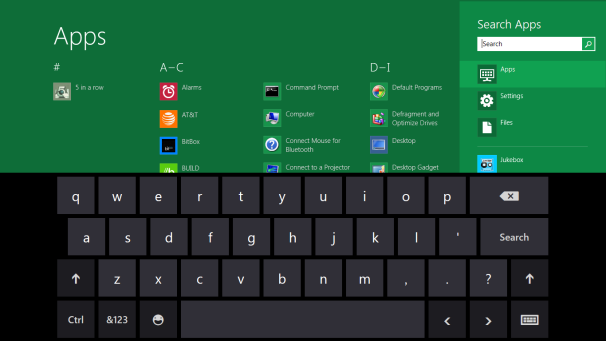 The new redesign does away with Windows 8's original alphabetical list of apps for a hierarchical one organized by program group. So instead of seeing all your Windows programs organized by their names, the new apps screen groups programs by software suite such as Microsoft Office or Adobe Creative Suite 5. The new apps screen is also denser, fitting more app icons onto the screen than the previous version. Dukhon says the new redesign improves "the scannability of your system, giving you confidence about what is on it at any given time." Some users are clamoring for jump lists -- a feature in Windows 7 that allows you to navigate to a specific file -- to be added to the Metro-style start screen interface. But Microsoft is reluctant to do that and is instead relying on what it calls secondary tiles. These tiles allow you to create what is basically a quick launch icon to a specific part of an app such as The New York Times world news feed in an RSS reader, a playlist in Media Player, or your best friend's profile page on Facebook. It's not clear if Microsoft has a different solution in mind for users who may want to access recently used document files from the start screen. As one blog commenter pointed out, "The beauty of the jump-lists is that not only you can ‘pin files,’ but it also keeps track of your recently used files. That saves a lot of time, which the start screen still misses." Microsoft also said it will be adding more customization options to the start screen. You can already do things such as unpin tiles and resize wide tiles into square tiles, but Microsoft said more customization is coming. "In the Beta, you’ll also be able to use other improvements based on this dialog, in addition to creating, naming, and rearranging groups," Dukhon said. If you'd like to read the whole post for yourself that goes deep into Microsoft's telemetry data gathered from users and other design considerations check out on Microsoft's Building Windows 8 blog.